Looking through the diffraction grating glasses. Understanding light, and its connections to electricity and heat is the central theme of Protons for Breakfast. 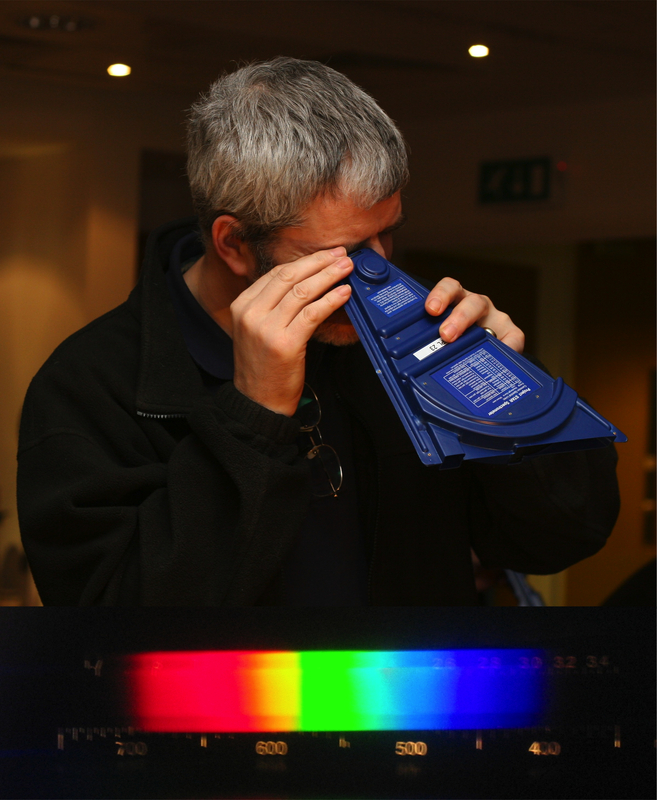 And a primary tool for understanding light is the spectrometer. So at Protons‘ we give out diffraction grating glasses (above) which split light into its component frequencies, each of which we perceive as having a different colour. These are big hit. We become more quantitative too by using hand-held plastic spectrometers (link or link) that display the spectra against a wavelength scale. And brilliantly conceived and simple though these are, they are tricky to use. 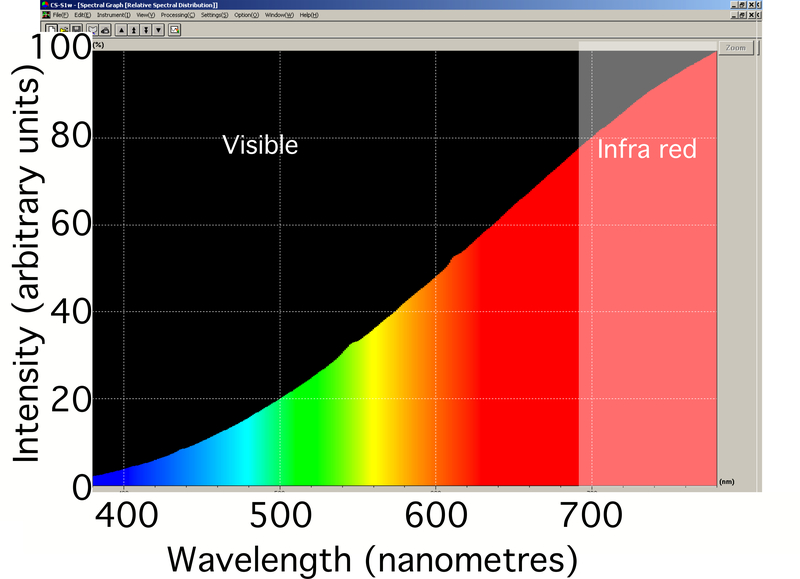 And although they give a quantitative measure of the wavelength of light, they give no information about the relative intensities of the different wavelengths. 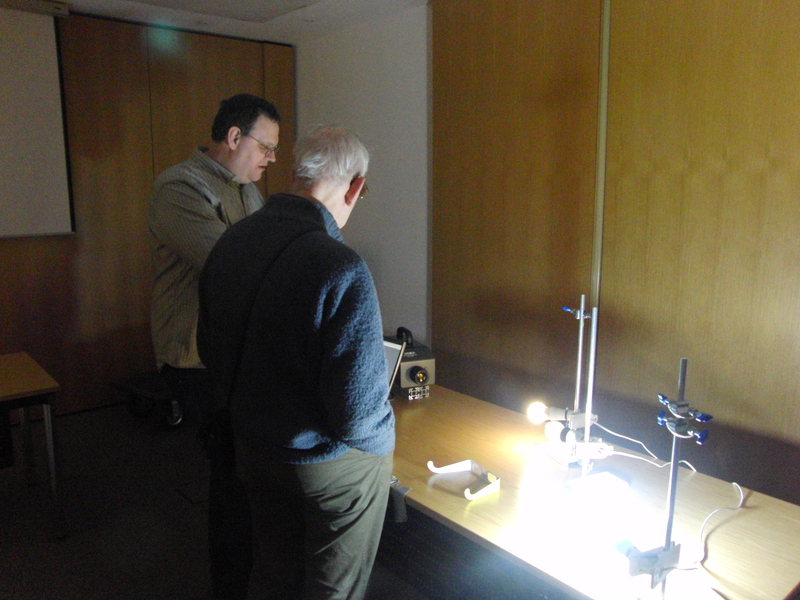 John Mountford capturing spectra at Protons for Breakfast. Click to enlarge. It turns out be difficult (=expensive) to get accurate information on the relative intensities of light at different wavelengths. But my colleague John Mountford noticed that an instrument for doing this was temporarily available, and so we took it along to Protons and tried it out. The results were very impressive and below I have put three screenshots of the light from three types of lamps: conventional incandescent, compact fluorescent, and the new fangled LED lamps. Each spectrum is strikingly different and to the physics detective, tells the tale of how the light is made. I will be looking at each of these three lighting technologies in future weeks, but for now just enjoy this beautiful data. If you would like to plot your own graphs, you can download an Excel spreadsheet containing spectroscopic data. The spectrum of an incandescent light bulb. Notice that the bulb gives out mainly red and infra red light. 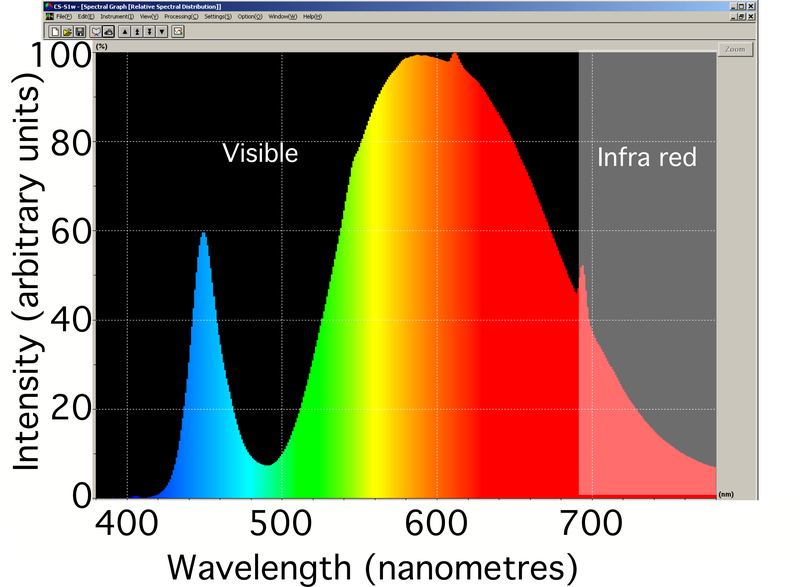 The bulb appears yellow to us because we are insensitive to red light and the small amount of blue, and detect primarily the green and yellow. Click for enlarged image. The spectrum of a compact fluorescent light bulb. Notice the very intense sharp 'emission lines' from the mercury within the bulb, and the relatively weak, smooth background from the phosphor. Click for enlarged image. The spectrum of an LED light bulb. Notice the bright blue emission from the LED itself and the fluorescence of the phosphor in the green, yellow and red. Click for enlarged image. This entry was posted on March 25, 2011 at 11:51 pm and is filed under Personal, Protons for Breakfast, Simple Science. You can follow any responses to this entry through the RSS 2.0 feed. You can leave a response, or trackback from your own site. Very nice graphs! I have many spectra photos I’d like to graph, what method do you use? How do you turn raw files in data for your spreadsheet? Hi. It is not easy. The data came from an optical spectrometer which had been calibrated so that the varying sensitivity of the silicon sensor in the spectrometer was calibrated out. If you are an amateur this a pretty tricky thing to do. How did you obtain the spectra? If you used a diffraction grating then from knowledge of the grating spacing and the distance to the source etc it may be possible to work out how the distance across the image corresponds to wavelength. How did you get the spectral images? 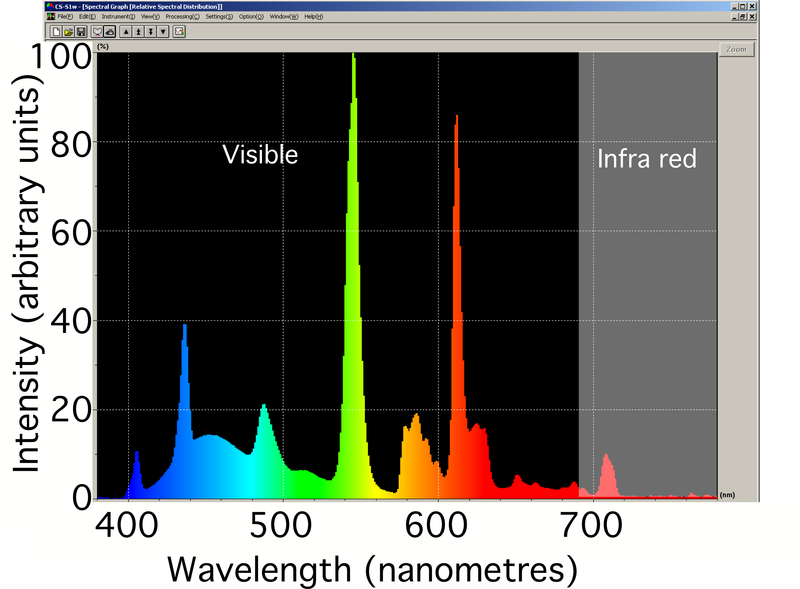 Our next issue is going to look into LED lights in some detail and one of the authors has pointed out your very useful light spectra graphics used in this blog post on Light. I wonder whether you would you be happy for us to reproduce these graphics in our article please? It’s a fascinating site by the way.